Where do I pick up my race packet and bib? What time does the race start and when should I arrive? The Kids Races will take place starting at 5:30pm with a warm-up at 5:15pm The 5K/10K starts at 6:30pm. We recommend arriving by 4:45pm for the kids’ races. Plan to arrive by 5:30pm for the 5K/10K. There will be plenty of activity at the venue. 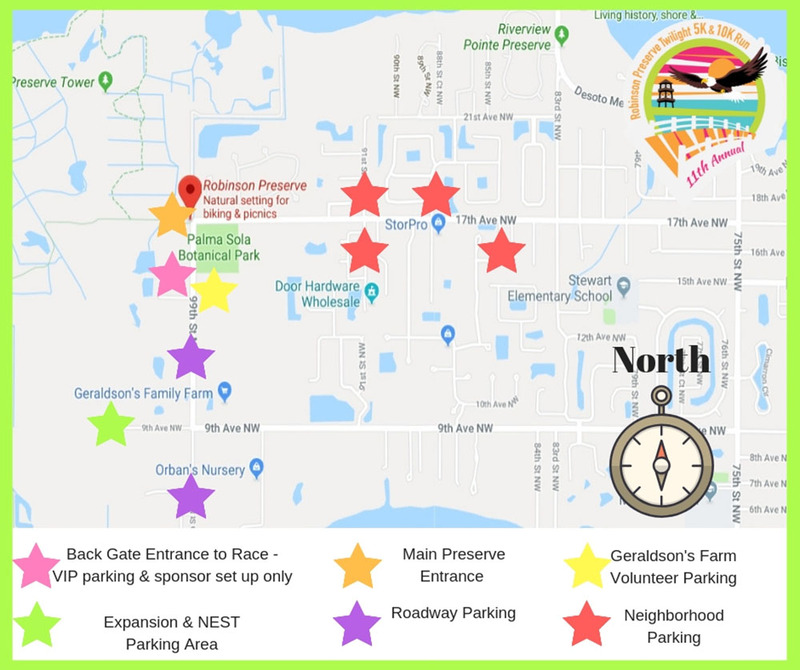 Parking is available throughout the area surrounding Robinson Preserve. Please note: NO parking is available inside of the main preserve entrance, however there is limited parking at the expansion lot on the corner of 99th and 9th. Road parking at the Palma Sola Botanical Gardens is available for handicap visitors only. We ask that all visitors please keep this lot open for these participants. Mango Park, Fiddler’s Green, Wisteria Park, Palma Sola Pointe, and Colonial Woods are all available for street parking. Golf carts will run from the corner of 9th and 99th to Preserve entrance and from 17th Ave at Mango Park entrance to Preserve entrance. The race goes on rain or shine! Only in extreme conditions will the event be cancelled. Should the event be cancelled your registration fee will be considered a donation to PACE and Robinson Preserve. Are strollers and pets allowed in the race? Yes, we ask that strollers and runners with pets (on non-retractable leashes) start in the last wave. If you would like to run with a stroller, please start at the front of the walkers' wave. Where can I use the restrooms? Portable restrooms will be on site. There will not be a bag drop. 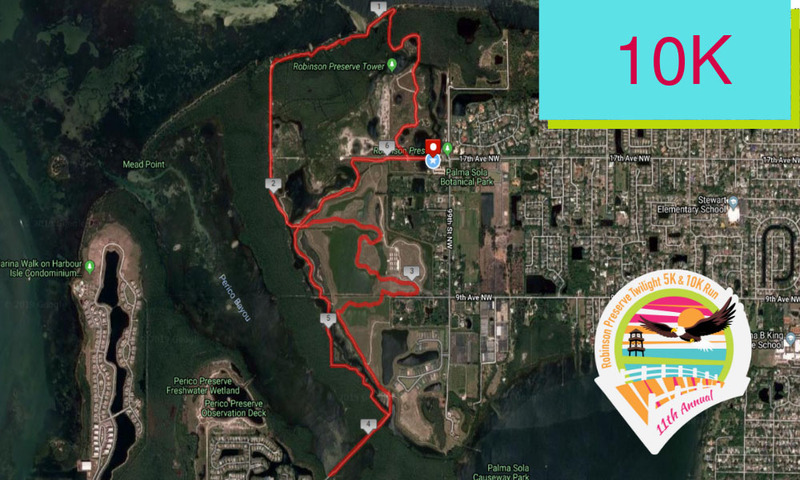 Are there water stops along the 5K/10K course? Yes, we have two water stops along the 5K/10K course. Pre-race and Post-race water will also be available. Who is the race benefiting? 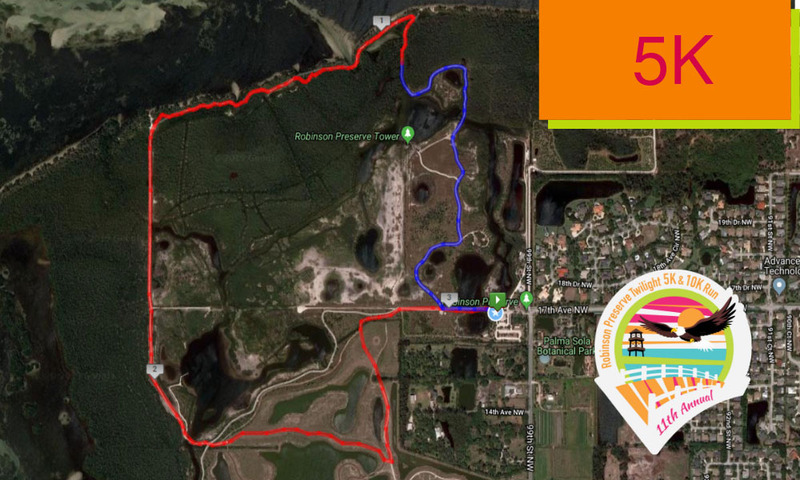 Proceeds from the Fit2Run Robinson Preserve Twilight 5K/10K benefit both: Robinson Preserve, managed by Manatee County Natural Resources and PACE Center for Girls of Manatee County. Does this race get crowded? We are again offering a wave, or corralled, start system this year. This will accommodate all of our participants by delaying each wave in 1-2 minutes increments. The wave start is divided based on your projected finish time. Your corral color will match your bib when lining up to start. Will the wave start affect my overall time? The race is chip timed so your time will start as soon as you cross the timing mat at the starting line. Where will results and photos be posted? Follow our Facebook page for updates! @RobinsonPreserveTwilight5K An email will also be sent to all participants with links to results and photos as soon as they are posted! Tell me about the course! Is there anything planned for after the race?